Ian Somerhalder and Nikki Reed surprised an undergraduate class at Emory's Goizueta Business School by stepping in for marketing professor Manish Tripathi. Imagine sitting in an 8:30 a.m. marketing class trying to wake up. Then… cameras. Lots of them. "Guest speakers," your professor says. But these aren't representatives from some Fortune 500 company. 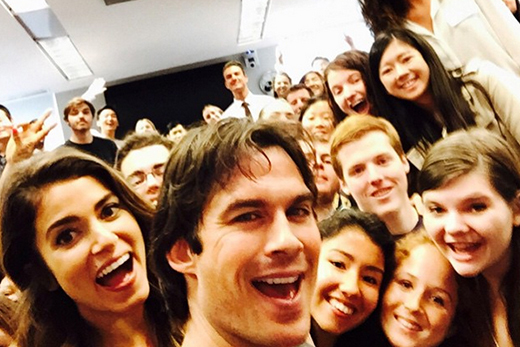 On April 1, actors Ian Somerhalder and Nikki Reed surprised an undergraduate class at Emory's Goizueta Business School by stepping in for marketing professor Manish Tripathi. Somerhalder is best known for his work in "The Vampire Diaries," which has filmed in Covington. Reed also played a vampire in the "Twilight" movies. The two are a couple, and shared their Emory visit via social media. Marketing was still the topic of class discussion: The duo took questions about personal branding and shared their experiences through Chevy's #bestdayever campaign, which put a positive spin on April Fool's Day pranks. Other celebrities, including Alec Baldwin, surprised students in similar fashion at universities and colleges around the country. "Thank you Emory University for giving us the opportunity to sub-teach your business/marketing class for an hour. Teaching is as much about listening as it is about talking. We learn from you guys, truly. Identifying your skills, your passions and then marrying the two is the key to success — to the future," Somerhalder wrote on Instagram, sharing a selfie taken with the class.